I haven’t posted any payment proof from what I have done since March 19,2011. The last payment was from my Virtual Assistant Payment 01 which was received last March 18th. Since it’s already July and I haven’t updated the payment proofs yet, I decided to just give you a screen shot of what I got since the last one until June 2011. Most of my online friends know I’m working as a Virtual Assistant for some clients. I have a full time work plus some other sideline VA jobs that I’ve been doing since August 2010. I’ve posted payment proofs here since I started and below are my latest earnings. I always tell myself even since my younger days that if I want to succeed in life, I’d have to go through a process called “learning” and “implementing”. 3 years ago I was just clicking advertisements from $0.0001 to $0.01 and it was really hard to earn a single buck a day at that time. I wasn’t contented of course, so I browsed the net for other online opportunities that could rake me thousands of $$ every month. I searched high and low but to no avail. I know some internet and affiliate marketers who are still earning what I have always aspired – millions of $$. But they are veterans in this field and mind you, they didn’t start rich either. As I traverse this not so lonely world of Virtual Assistance, I see sparkling stars and of course $$ along the road. I would just have to work even harder to achieve and maybe surpass my mentors (they don’t even know they are mentoring me, silently,lol) so that I can finally be free of all financial worries. Of course that won’t be possible if I keep earning this way, so I gotta think of some other ways to make it into a reality full of blessings but not to make me greedy and arrogant. It is possible to earn a living online and as I always say – “only if you know where to look”. Try to befriend Mr. G and it will tell you whatever it is you wanna know. Virtual Assistance is a booming industry for us Filipinos and worldwide. If we can scour the net for more advanced teachings related to becoming an effective Virtual Assistant, we may even be given the record for Outstanding Virtual Assistants in whole wide world and world wide web. Note that this business has been going on since early 1990s and now fast becoming popular amongst Pinoys who are seeking legit online jobs. Stay at home moms can now gain back their lost self-confidence and use their acquired education to pursue a job that would not entail too much stress like that of an office work. Heck, I can even multi-task doing online work, cook and tend to the children. It is not like working 8 to 5 but better, because most employers does not require you to be at their beck and call all day. Mine only requires complete submission of daily tasks so if I am done earlier than usual, I still can do other sideline tasks for other clients. But having 2 or 3 or even more employers/clients at the same time isn’t really the “cool thing” to do. Your main tasks/projects may suffer for lack of concentration or even time. You have to be on top of every little thing and must be great at multi-tasking. otherwise, you will end up with no clients thus no earnings. I am not saying that I’m a superwoman. But I get things done, period. The only downside is, my personal blogs suffer because I can’t update all 10 as much as I want to. But still thanking Mr. G for bestowing PageRank+2 on each of them except the new ones, of course. Anyway, if you are always online seeking for a much stable job, I’d suggest you try and research the keyword “Virtual Assistant”. There will be thousands of search returns so it’s only right to start from the first page. Next is, be a voracious reader and consume as much information as possible. This isn’t the regular school reading session and your future depends on how you can digest all things you have read. Take it slowly, or however you want to do it. it’s you call anyway. Just that, whatever you read, learn to dissect, scrutinize and analyze, because that is one skill you will need when you apply as a Virtual Assistant. Wow! That was a big earnings. This is what I needed right now. I got inspired by your earnings. I am exploring other possibilities on how to make money online. I will be doing a lot of readings about being a VA. Thank you for sharing this tips. Try doing it with your blogs muna and see if you can do it. You won’t know unless you try sis 🙂 Thanks! wow your doing well! Good job! It is so good to hear that I am not alone working online here in the Philippines!! he he he.. How did you get you clients? Did you use freelance sites or do you have your own sites that lists your skills and services to offer to your clients? My last month earning is $1500 and this month $200…:)…. I didn’t go thru the Freelance sites but was actually hired direct, though I have listed myself with such. Great job on your earnings and hope you earn more in the coming months! Eihdra, every time I see your payment proofs I get inspired to really do more VA jobs. But, for now, I still can only work part time and not the extent of VA jobs you do. I would also like to do that someday, if not for someone else, maybe for my own business. 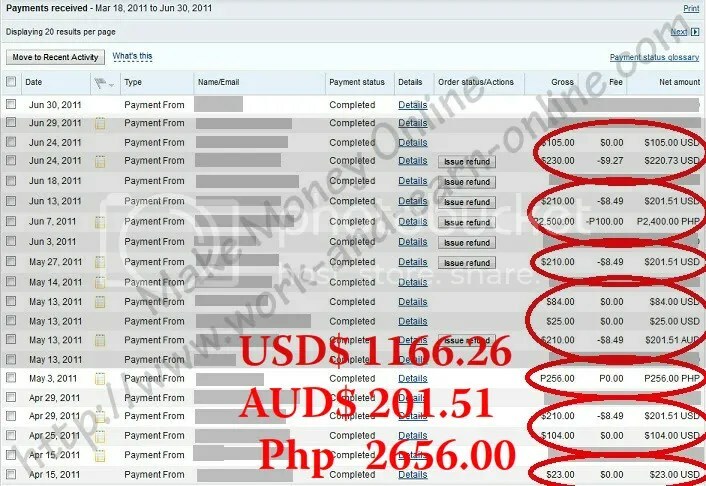 Wow, that;s a lot of money already … Like you sis started din ako sa mga PTC then nagsawa $2 for almost a month waahhhhh .. Buti n lang i was introduced in blogosphere pero maliit pa rin ang earnings pero thankful na rin atleast kahit papano meron nakukuha even working at home. Thanks for the advice and congrats ulit for being successful Virtual assistance. Hoping that all work at home moms will have an opportunity to earn more than me sis 🙂 Thanks! Thanks for the inspiration. I want to be a VA myself, and finally be able to give up my day job. I’d give anything to spend more time with my kid at home, and earn dollars while I’m at it. Thanks again for this post. I admire you from what you’re doing. VA is not just as easy as other thinking. Maybe I’ll try that someday.. but for now I will enjoy my blogging habit. Thanks for the info..
Hey there! true it isn’t as easy as other people think because blogging is way different from article writing. Hope soon, you’ll find your way into the Virtual Assistance world 🙂 Thanks! this is very inspiring. I just wanna know what sites or programs you can suggest for applying VA work. i have tried applying for this VA job but they turned out scam. Any advise would so much be appreciated. Thanks:). Wow, thanks for the post. I hope I can do that too. Wow, such an inspiring post, I’m really interested in this VA. Im a blogger, but I considered myself still as a newbie although I’v been blogging for 2 years now. Maam can you help help kung saan ako pwede mag apply for that VA position? There’s so many in the net, I just want to know maybe if there a legit site to go to? Odesk, Freelancer and Elance Thanks! Thank you for your tips and advices. This has just served as another inspiration to do better. Keep it up! waaa.. parang gusto ko nang matuto! Search ka lang sis sa Google and you will find lots of articles about this. Thanks! Gee, coming from you, this is really heart warming. Thanks Red! You have got to teach me how to become a VA 🙂 Congrats on all your earning and I know you’re still continuing to do a great job for all your clients! Hi Event Lover! The initial tips are already in the post, you just have to do some more research about this job. You can start by reading Your Filipino Virtual Assistants and Virtual Assistant Seminar. Thanks! Wow Sis! I have never earned more than $500 working as a freelance writer.. 😛 I tried doing SEO but it’s really not my cup of tea.. 😛 I have no idea what a virtual assistant does so I am a bit hesitant to try it out, although I have been told that VA’s get paid a lot. Hi Ane. Actually, what you have been doing as a Freelance Writer is what I also do with some clients. Being a VA kase means you can do general things like writing, spinning, submissions, social media, and other SEO. Kaya mo rin yan sis just keep polishing your skills and soon you’ll be a full time VA. Thanks! I’ve been encountering the VA word from other mommy bloggers that I met the past 11 months since I started blogging, but haven’t look at it seriously. My hopes are lifted by posts like this that when the right time and opportunity comes, I’ll be able to pursue a new career of being a WAHM and have more time for my family. Thanks a bunch! (for the silent mentoring :)) Keep it up and GOD bless! Wow! good job! I’d love to know more about this. Hi Vera! hehehe, this is what I do every single day oh except Sundays hehe..